A graduate of Roanoke College and of UVA Law School in 1958, Ernest Linwood Folk was a known scholar in the fields of corporate and securities law, as well as arts and entertainment law. At UVA he earned both an LL.B. and M.A. and was a member of the editorial board of the Law Review and elected to the Order of the Coif. He joined the UVA law faculty after teaching at the law schools of the University of North Carolina and the University of South Carolina. He had previously been an attorney with the U.S. Department of Justice, Antitrust Division, from 1956-59, as well as a visiting professor at Columbia, Michigan, and Duke law schools. He was a Reporter for the 1967 revision of the Delaware General Corporation Law, a statute governing more than half the nation’s Fortune 500 companies. 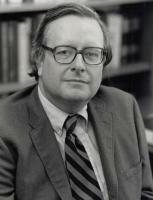 From 1970 to 1976, he edited the Securities Law Review. As a professor at UVA, he taught such classes as Corporate Finance, Non-Profit Corporations, Business Planning, Law and the Visual Arts, Law and the Performing Arts, and Securities Regulation. He published The Delaware General Corporation Law: A Commentary and Analysis.